Kano - Mangen Research Associates, Inc.
A persistent problem that we see when doing any research that tests customers' interest in new products, or new features that are considered for an existing product line, is that all of the features are considered attractive and none can be readily ruled out of the mix. 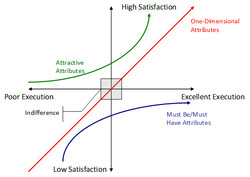 In some respects that would be just fine if a deluxe, feature-rich product had a major impact in the marketplace, but in reality all too often the apparent attractiveness of the different features is a byproduct of the tendency of survey respondents to be nice, agreeable, and supportive in the research process. Must Be evaluations are the equivalent of table stakes. Including this feature is critical and will not yield substantial customer satisfaction, but excluding the feature will lead to very dissatisfied customers..
One Dimensional features are where the more of the feature you have the better. The mileage that you get with your automobile is a good example of a one dimensional feature. Attractive features are those where the absence of a feature does not drive significant dissatisfaction, but its presence creates considerable satisfaction. Back in the day, cup holders in automobiles were attractive features; now, however, cup holders probably are must be features. Indifferent features are those that do not significantly differentiate themselves from the status quo. Reversals are features where the status quo is preferred to the proposed "enhancement." Reversals are typically seen when a valued feature is taken away. Completely eliminating face-to-face or telephone customer support, and requiring that all customer complaints be handled via the internet, would probably produce a reversal reaction -- at least initially. Lastly, features may fall into a Questionable category. This typically occurs if the feature description was lacking or unclear, or when the respondent is not treating the research exercise seriously. The Kano methodology treats features in isolation from one another, and emphasizes the comparison not to other features but rather to the existing state of affairs. As such, they are often used when companies have generated a large number of initial ideas regarding possible enhancements, and they want to see which of these enhancements "moves the needle" and generates considerable interest in their target markets. Contact us to learn how this approach might benefit you in your product design initiatives.